George Washington Gayle is not a name known to history. But it soon will be. Forget what you thought you knew about why Abraham Lincoln was assassinated by John Wilkes Booth. No, it was not mere sectional hatred, Booth's desire to become famous, Lincoln's advocacy of black suffrage, or a plot masterminded by Jefferson Davis to win the war by crippling the Federal government. 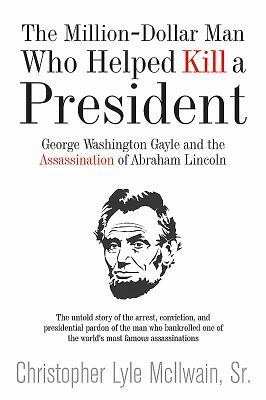 Christopher Lyle McIlwain, Sr.'s The Million-Dollar Man Who Helped Kill a President: George Washington Gayle and the Assassination of Abraham Lincoln exposes the fallacies regarding each of those theories and reveals both the mastermind behind the plot, and its true motivation. The deadly scheme to kill Lincoln, Vice President Andrew Johnson, and Secretary of State William Seward was Gayle's brainchild. The assassins were motivated by money Gayle raised. Lots of money. $20,000,000 in today's value. Gayle, a prominent South Carolina-born Alabama lawyer, had been a Unionist and Jacksonian Democrat before walking the road of radicalization following the admission of California as a free state in 1850. Thereafter, he became Alabama's most earnest secessionist, though he would never hold any position within the Confederate government or serve in its military. After the slaying of the president, Gayle was arrested and taken to Washington, DC in chains to be tried by a military tribunal for conspiracy in connection with the horrendous crimes. The Northern press was satisfied Gayle was behind the deed--especially when it was discovered he had placed an advertisement in a newspaper the previous December soliciting donations to pay the assassins. There is little doubt that if Gayle had been tried, he would have been convicted and executed. However, he not only avoided trial, but ultimately escaped punishment of any kind for reasons that will surprise readers. Rather than rehashing what scores of books have already alleged, The Million-Dollar Man Who Helped Kill a President offers a completely fresh premise, meticulous analysis, and stunning conclusions based upon years of firsthand research by an experienced attorney. This original, thought-provoking study will forever change the way you think of Lincoln's assassination.